This is the fourth in a series of Q&As with shepherds who raise sheep on the Conservation Priority List for wool. The opinions expressed by the shepherds do not necessarily reflect those of The Livestock Conservancy. Emily Hartman raises Leicester Longwool sheep on her farm, Mrs. Hartman's Farmhouse Market. You can also find her on Facebook and Instagram @mrs.hartmansfarmhousemarket. The real question, is why wouldn't you? Here we have an amazing creature that provides us with not only meat and in many cases, milk... but also a useable, wearable, craftable of some sort, fleece. In my opinion, sheep are the triple threat of livestock and you can win no matter what! Is it challenging to raise sheep with an eye towards selling their wool? Why or why not? Yes it can be. There are so many factors that play into the quality, that when people ARE interested in being put on a waiting list, it's hard to really know how much to expect. Unexpected illnesses can ruin a fleece in an animal that may have had an excellent fleece the year before. Sometimes they get into stuff. For example, my beautiful pure black ewe lamb decided to roll in a bunch of "stickers" on the way down the hill to get shorn. Her fleece was fairly clean up until that point. Also, in the case of Longwools you always ask yourself, should I shear once, or twice a year, because the end product is so different and generally used differently (long locks vs a more "avgerage" staple length). You have to be extremely vigilant to keep the creepy crawls such as lice and mites at bay. Especially when growing out those fleeces for a year. If you don't keep up, it's difficult to treat a sheep in full fleece. Sort of piggybacking from the previous answer, I am doing my best to offer as wide a range of product as I can. I am attempting to hold a few sheep back from shearing to offer locks, washed and unwashed. I try to offer the unwashed first, and then offer washed and dyed as I get around to it. I think locks offer the largest amount of artistic freedom as there are so many things you can do with them. The great thing about Leicester Longwools is that the lambs fleeces can be next-to-skin soft, while the adults make beautiful lustrous wool perfect for outerwear. I am able to shear 2x a year, so I am trying to even it out so that winter/spring shear gets sent to the mill and summer shear left raw (any leftover summer fleeces get sent in to mill after the next shearing) My mill I send to requires a minimum amount for millspun yarn, but not for roving, and since at this point, I don't have much for lamb wool, that dictates that it gets separated out into roving, while the adult fleeces get combined into millspun. Summer fleeces, as I said, I sell raw. I bring them with me to the farmers markets, and it generates a lot of conversation. Sheep health is key. Nutrition, pest management, the whole works. A few sheep may require a little extra attention. If you don't have healthy sheep, you can't expect good wool. 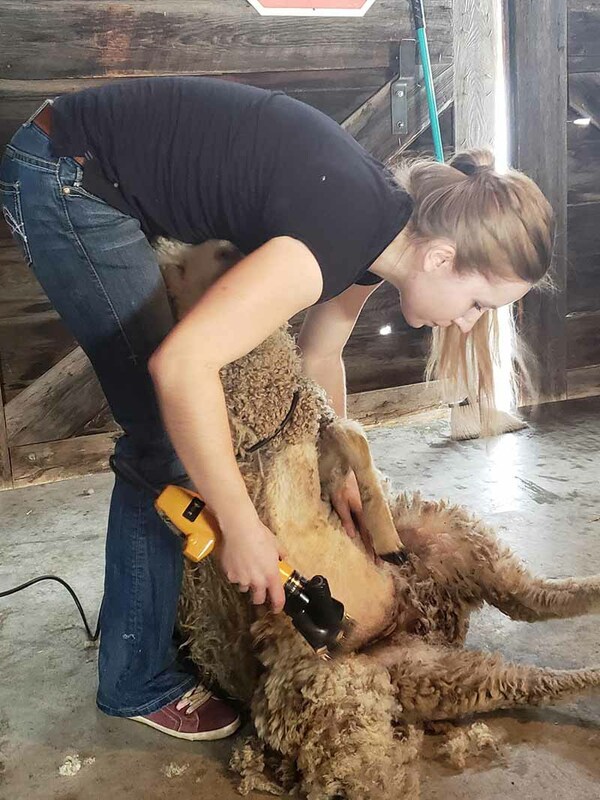 Emily shears her own sheep so she can keep a closer watch on their health. Mine are not coated. 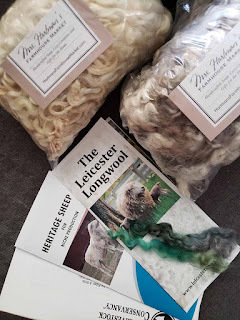 And although I don't think I'd attempt an uncoated sheep of fine wool breeds, the Leicester Longwools (and I'm sure other longwool breeds) tend to actually stay fairly clean. You can shake them out a bit and you're in business. I think this also depends on the way you feed them as well, since overhead feeders will leave your sheep a mess. Mine are fed on the ground, and in their natural grazing position, they keep fairly clean. They're even cleaner in the summer when they can roam the pasture. If the pen was smaller, and not well maintained, they would be a mess in no time, no doubt. People love to get to know your animals as you do. They love the story that goes with them. Since I don't have a brick and mortar store, it is important to put yourself out there. Since I don't have a store to present to people, my boxes arrive at their doorstep to represent me, so I always make sure my packaging is nicely presented. I think every little detail helps. When I'm at farmers markets, even if I don't sell the wool that day, people love to generate conversation about it and the sheep. Overall it's a LOT of work and also A LOT of fun. This is the first in a series of posts profiling fiber artists who are participating in Shave 'Em to Save 'Em. 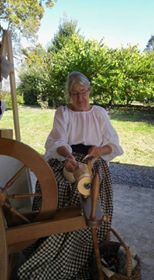 Fran Stafford is one of only two people who have already spun at least 15 of the wools on the Conservation Priority List. You can find her online at her blog. What fiber art(s) do you participate in and for how long have you done each one? Crochet, started about 57 years ago and now only use it rarely. Knitting, started about 58 years ago, made one sweater poorly, quit until 15 years ago and took it up again, knitting mill spun yarn. Spinning with a drop spindle about 10 years ago, added a wheel, then more wheels beginning about 6 years ago. My preferred fiber art. Weaving on a small rigid heddle loom about 3 years ago, did not like it and sold it, but started Revolutionary War reenactment and built and weave on a box/tape loom, got a 5' tri-loom for Christmas and have made two shawls. When did you start working with fiber from rare breeds of sheep? Without knowing they were rare breeds, I have been using Jacob, Shetland, and Leicester Longwool since I started spinning. 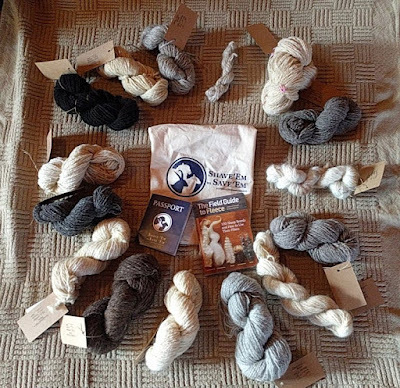 What was your biggest surprise when you purchased your first rare breed wool? No real surprises until I started SE2SE and realized how different the micron count, staple length, and softness or lack of there was. Have you had any challenges purchasing wool directly from shepherds? Most have been prompt and very courteous about responding to either let me know how to order from them directly or where their online shop was, but there have been a couple that were private messaged on FB and never received a response. What do you love most about working with rare breeds? The difference in texture requiring me to up my spinning skills to accommodate. What is your favorite wool from sheep on the Conservation Priority List and why? I really, really love Jacob for its color variation on each fleece and it's crisp texture spinning and knitting, but Shetland is a close second. What bit of advice would you give another fiber artists who is just starting to explore the world of rare breed wools? Don't feel like you have to do an entire raw fleece from each breed, try a few ounces from a couple of breeders as they will be different. 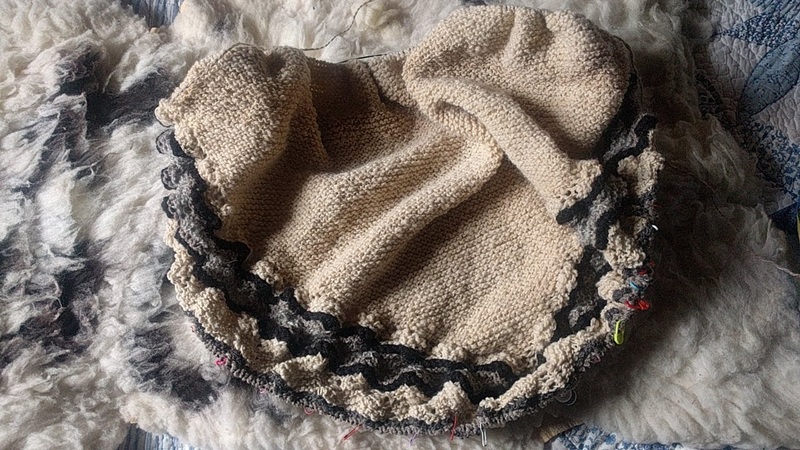 Use undyed wool, it feels entirely different than dyed wools. This is an experiment to try different ones. A blanket or large shawl will allow you to use the single skeins you purchase or spin. I am indebted to my friend and shepherd, Gail Groot who told me about this challenge last summer and let me know when it was about to actually start. What is the Hudson Valley Textile Project? 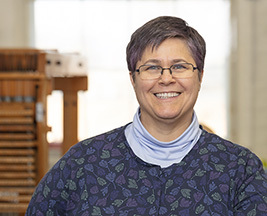 Lilly Marsh, HVTP board member: The Hudson Valley Textile Project is a 501 C 3 non-profit consortium of fiber producers, processors, artisans and consumers focusing on strengthening a farm-to-fashion supply chain here along the 250 mile Hudson River watershed. Our region has a growing farm-rural tourism industry primarily organized around food, but we are working to educate consumers (and producers) that fiber products can be seen as the same fusion between agriculture and creativity. Like the local food movement, local cloth touches on a range of consumer concerns including environmental concerns around sustainable land use and carbon sequestration, responsible animal welfare management, the support of small production and regional manufacturing jobs and capacity, a growing value among artisan fiber artists for local materials and processing, and a corresponding growth in consumer value for ‘slow fashion’ over disposable fast fashion models. We are a young organization as yet, but are currently offering a number of benefits to our members designed to assist them in connecting to retailers and consumers, including promotion on social media platforms, maintenance of a regional resource list, product hangtags identifying local production, a curated photo library for member use in their own promotional work, and organizational representation at selected craft and trade shows. We are currently exploring the idea of a sellers’ cooperative that would further knit local raw material production with processors and end users. Our third annual meeting, March 20th at SUNY New Paltz, offered members an opportunity to network and show off their products, as well as bring themselves up to date on regional topics and collaborations. Our keynote speaker this year was Stephany Wilkes, sheep shearer and author of Raw Material: Working Wool in the West, and president of the Northern California Fibershed Cooperative. How do you work with shepherds? 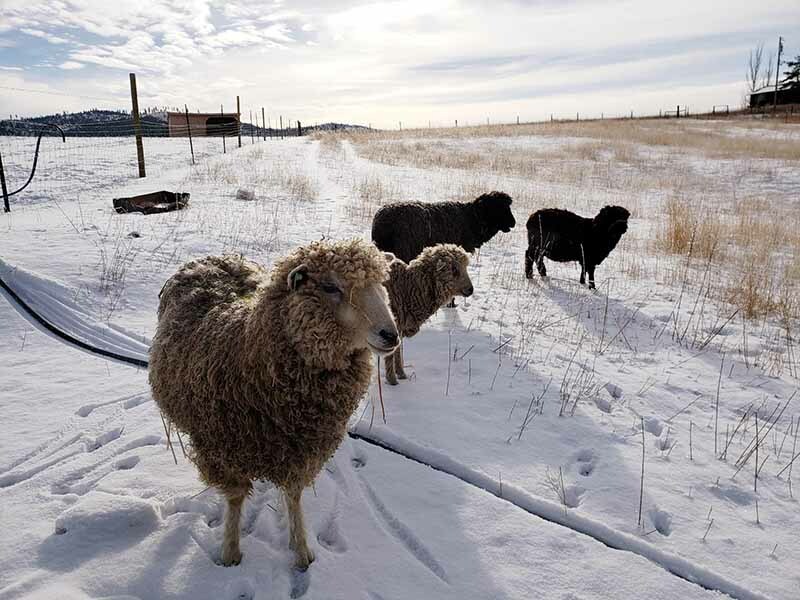 The HVTP organization offers the shepherd connections to those artisans and retailers interested in working with local wool and alpaca. Through those connections, a shepherd can begin to understand the needs and preferences of the fiber community. This can be a simple as offering a shepherd promotional space on our social media platforms, or a far deeper collaboration between members of the organization. One example of the deeper collaborations has been between Blue Pepper Farm, a high peaks area sheep dairy operation in Jay NY, and myself, the weaver at Lilly Marsh Studios. I became interested in developing a Hudson Valley studio yarn and had met Shannon Eaton, Blue Pepper’s shepherd, through the HVTP. I worked with her one afternoon 2017 on skirting her fleeces and helping her understand the aspects of her wool that would concern a fiber artist. That year, Shannon commissioned me to weave about 10 yards of fabric for her use. I was quite impressed with her wool and I purchased her entire 2018 clip. Her work in keeping the fleeces clean and in thoroughly skirting the 2018 clip was a strong supporting factor in that purchase. Her East Friesian dairy wool, blended with Little Creek Alpaca fiber (80/20 blend), and spun in a semi-worsted process, is making up into some stunning blankets and yardage for sewing, and I’ll be marketing them this summer and fall. They will also be featured in the fall issue of Ply Magazine, a handspinner’s publication. I am planning on purchasing her entire 2019 clip at this point. Collaborations of this kind develop over time and can grow out of the most informal of connections. As one of the weavers for the Battenkill Fiber Mill in Greenwich NY, I make myself available to shepherds who want to understand the milling and weaving process, and how to best present their wool into that process. Due to the conversations that Shannon and I had over the skirting table in 2017, Shannon’s work to keep contamination at a minimum throughout the year, and her excellent skirting in 2018, paid off. Her 2018 clip gave me an amazing 80% yield from raw weight to finished yarn on her fleeces, and made the $3 per pound price on the 32 fleeces well worth the investment. Does a shepherd need to have a flock of a certain size before you will work with them? No. We are fortunate in our region to have a processor who is happy to work with very small batches (even a single fleece). Battenkill Fiber Mill acts as a central hub in our work as its commitment to the small producer allows for small flocks to foster their own yarns for sale at local markets and yarn shops. Mary Jeanne Packer, the mill owner, is very experienced in working with a wide variety of breeds, and in leveraging the entire production process to the end goal of the yarn. Is there a profile of an ideal shepherd who works with you? 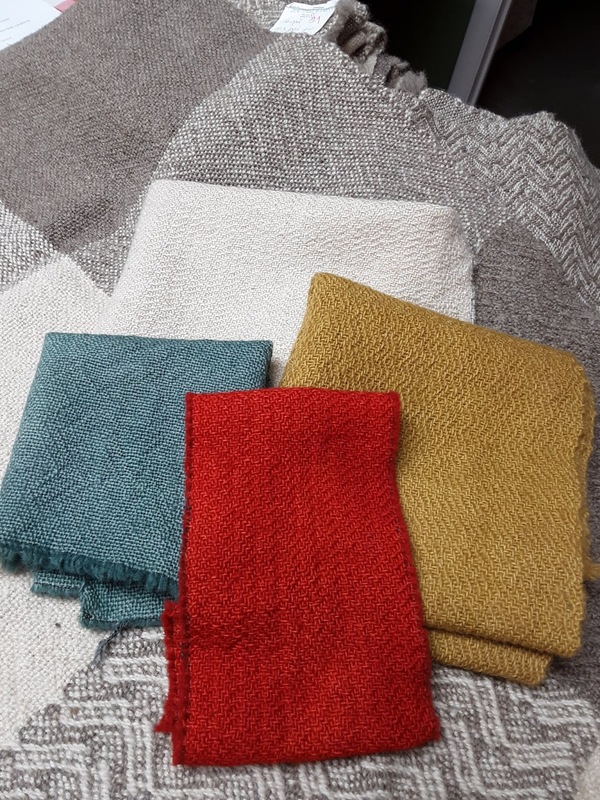 Our shepherds are all very interested in marketing and selling their wool, and are often heavily involved in local farmers markets or their own on-farm shops for a variety of farm products. They are often either strongly connected to fiber arts themselves, or are at least quite knowledgeable about the field. Are there any common misconceptions that you hear from shepherds? Shepherds who are not themselves fiber artists are often strikingly unknowledgeable about their wool and with unrealistic expectations of the milling process to transform it into vegetable matter free soft yarn. Vegetable matter and plastic threads are very difficult to remove from the wool once they are present. As the process moves on towards yarn and an end product, it becomes increasingly difficult to remove. As a weaver, I inspect my final cloth with tweezers, picking out visible pieces, but hours spent at that task greatly increase the cost of the final product. And I have refused to work with wool that is too contaminated as such yarn can damage my power loom, causing jams and misfires. To some shepherds, all yarn is the same, and they recognize little differentiation between a strong high twist sock yarn, a soft 3-ply baby yarn, or a woolen spun 2 ply for sweaters, or a fine worsted singles for weaving yardage. Wool is not interchangeable in suitability for specific purposes. If a shepherd has the chance to work with a fiber artist through your Shave ‘Em to Save ‘Em program, it is an excellent opportunity for the farmer to understand far more about their own wool’s properties for various end uses. You can connect with Lilly on Instagram @lillymarsh or on her Facebook page.